Deliver personalized messages to your customers via email, SMS, or your existing messaging system to help them avoid weather-related disruptions. Alerts are powered by the most accurate weather data from 26 billion daily forecasts, 250,000 worldwide weather stations, and more than 100 meteorologists. The data provides 100x greater coverage than public data and is updated every 15 minutes. Create alert triggers from weather perils that you select based on specific weather events and levels of severity, or set custom triggers. Alerts are sent via email, SMS, or through your existing messaging system. 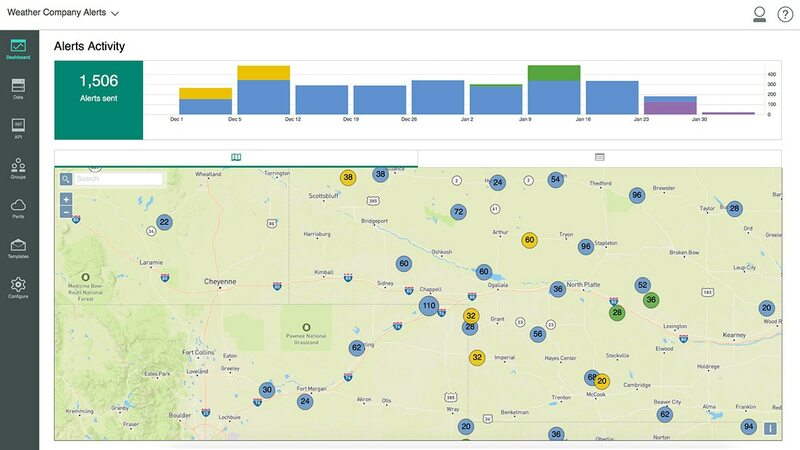 The dashboard shows who was alerted, where, what kind of alert they received, and when it was sent. Your data can be exported into spreadsheets for further analysis with Watson Analytics or the analytics tool of your choice. Cloud-based weather alerts are fast, easy, and self-service. Weather alerts do not require specialized hardware, software or IT support, but live help from The Weather Company is always available.